Since the multiple-Tony-winning The Book of Mormon opened three months ago, anywhere between 450 and 600 people have showed up to each show hoping to snag one of just twenty reduced-price lottery tickets, leaving a total of around 13,000 people to walk away empty-handed. Faced with such overwhelming fan response and high percentage of disappointment, last Friday the show’s producers put on an extra, ninth free show only for unlucky lottery entrants (and a few journalists). Needless to say, there was quite a turnout. It’s been heady days for the Mormon cast and crew, with all the ecstatic reviews, Tonys, and sold-out shows. 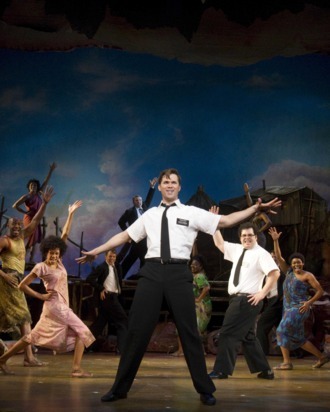 It seems like nobody can resist the show, not even Mormons … with a few caveats. 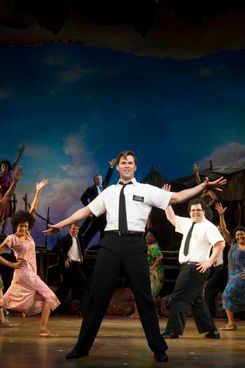 “We’ve had a lot of Mormons who’d come and they’d say, ‘We didn’t like the language,’” said co-star Andrew Rannells. “But they say the show is great, so it’s been received well. By Mormons! Who knew?” This sentiment held true for the Mormon gentleman sitting behind this writer at the free show: It was his fifth time seeing the show, and he has tickets to see it again next week.